As a city emerging from an eight-year crisis, Athens is making real progress in charting a new future. 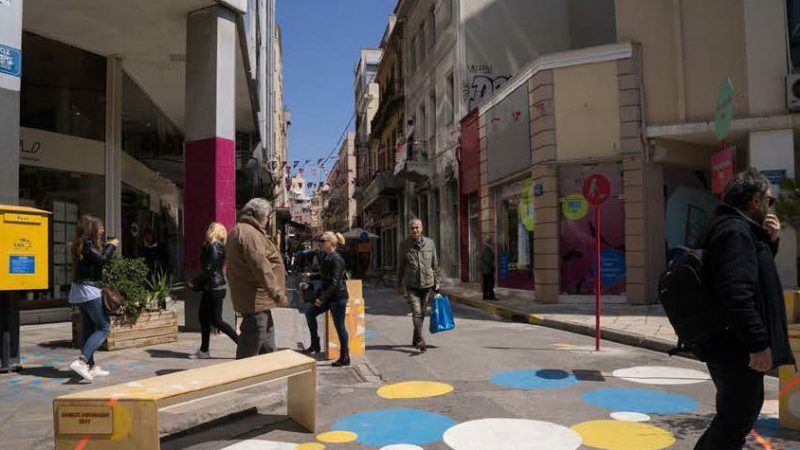 Under the leadership of Mayor Giorgos Kaminis, the city is employing creative solutions to improve quality of life, and his focus on cultivating community pride and optimism is making a real impact. One of his cornerstone projects has been the revitalization of the Trigono neighborhood. Since 2015, Bloomberg Associates has worked with Mayor Kaminis to advance his priority projects by sharing expertise from the global network of client cities. Bloomberg Associates is the international, philanthropic consulting arm of Bloomberg Philanthropies, providing select mayors and city governments with custom consultation and mentorship. This episode features conversations with Alexandros Kambouroglou, the Executive Director of the Athens Partnership, and Elina Dallas, the Project Manager for the Trigono program. Jake Elder of Bloomberg Associates Sustainability Team joined them in Athens. If you’re an avid news consumer, you’ve probably heard that Athens, Greece is a city emerging from an eight-year crisis. At its peak, unemployment reached 30%, and budget gaps and outstanding debt each reached 15% of the nation’s GDP. The challenges didn’t end there –at one point, over 2,000 refugees arrived on the shores of the country daily. However, under the leadership of Mayor Giorgos Kaminis, Athens is making real progress in charting a new future. By employing creative solutions to improve quality of life, his focus on cultivating community pride and optimism is making a real impact. Bloomberg Associates is the international, philanthropic consulting arm of Bloomberg Philanthropies providing select mayors & city governments with custom consultation and mentorship. Since June 2015, we’ve been working with Mayor Kaminis to advance his priority projects by sharing expertise from our global network of client cities. In this episode, we explore the city’s efforts, with Bloomberg Associates help, to revive Athens’ 27-acre Historic Commercial Triangle District, referred to locally as “Trigono”. Despite its historic and geographic significance, the neighborhood fell into disrepair in the 1980s. As a result, vacancy rates reached 17% for ground floors and 45% for upper floors, while a survey of shopkeepers in the area found that 50-70% believed graffiti, lack of cleanliness, and illegal parking were serious issues. While there were pockets of economic activity, the neighborhood was not pedestrian-friendly and it was struggling to attract new investment. To address concerns, the city is undertaking a 2-million euro infrastructure project in conjunction with a program to revitalize the neighborhood. The result will make the area easier and safer to navigate, provide new seating, improve lighting, and enable a fresh trash collection scheme. Mayor Kaminis developed the approach with the financial help of the Stavros Niarchos Foundation and expertise of Bloomberg Associates. This episode features conversations with Alexandros Kambouroglou the Executive Director of the Athens Partnership, and Elina Dallas, the Project Manager for the Trigono program. Jake Elder of Bloomberg Associates Sustainability Team joined them in Athens. JAKE ELDER: Thanks for making the time today. I really appreciate it. Athens has been under a range of stresses for the past decade and dating back even beyond that. Can you just speak a bit to what success means for a city in this kind of really challenging political environment? ALEXANDROS KAMBOUROGLOU: People in Greece and in Athens in particular are very tired and disappointed and in many ways have lost hope, definitely hope in anything that is government. So it’s extremely important to rebuild that trust and try and develop a sense of civic pride, which can be done by convincing people that you can deliver on projects. Trigono is one of these projects where we’ve seen that change. People who were questioning whether the city would follow through, would consistently try and implement the changes that were announced. Over time, they now say that they are happy to go back to work again because they’ve seen this tiny little change, which is just the effort of the city. This, I have to emphasize, goes—works both ways, not just for the residents but also for the municipal workers, who are the people ultimately doing the work. ELDER: So clearly there are opportunities for urban revitalization all across Athens. Why pick a project in this specific neighborhood? KAMBOUROGLOU: The area is defined by three of the city’s largest and central squares. It’s right on the foothill of the Parthenon, the Acropolis. It’s right in the center of the city. It’s probably the first streets that people—any tourist visiting Athens will walk through. Trigono, you will see all the problems faced right now in Athens on every single level from the difficulty to implement the law, the fact that announcements have been made over many, many years, decades about changes in pedestrianization that hasn’t happened, hasn’t been realized. It’s not just a tourist neighborhood, it’s an active, live Athenian neighborhood with a historical market You have a mix of everything—tourism, everyday Athenian life, difficulties in government, and a seeming lawlessness. Coming in and deciding to make this public space work properly as it should, get all the city agencies to perform better, try to establish the rule of law in terms of, you know, where people park and where people can walk is a multileveled challenge. That’s exactly, I think, why the mayor wanted to pick this area because if you can make it work here or to the extent that you can make it work here you’re showing that change is possible anywhere. OLIVER: We now welcome Elina Dallas, the Trigono Project Manager, to talk about the interventions in greater detail. ELDER: So we just heard a bit about Trigono and why it’s so important to the city, but I’d love to hear from you and have you talk a bit about what your program specifically is trying to accomplish in the neighborhood. DALLAS: Trigono occupies an area of 28 acres with 20 narrow streets, which are all now functioning through the program as pedestrian streets. At the end of the capital works, we are going to end up having two miles of pedestrian streets. This is quite a change from the past. Only a year ago, the whole area was a huge parking lot. Cars and scooters were parked not only in the street but also on the pave ways. Pedestrians could hardly stare at the shop windows, and often the shop entrances were blocked by vehicles. ELDER: When I think back to some of my first trips to Athens and walking down some of the neighborhood, there were cars everywhere. I just—I can’t emphasize enough for our listeners the ambition that comes with wanting to create two miles of new car-free zones in the center of a city that operates like Athens does. ELDER: Can you take us back a year and walk us down Vyssis Street, which is one of the main roads in the area, and just tell us a bit about the street and what it looked like before you started your work? DALLAS: I would love this to be on television so you could see the pictures of it. Vyssis Street is one of the widest streets of Trigono, actually, so it’s a road. Just a year ago it was full with parked cars. In the middle, you—with a normal kind of sized car you would struggle to get through, and at the same time you would have some pedestrians who were struggling to get in the shops. All the facades of the buildings were tagged. ELDER: So thus far we’ve talked about the Trigono intervention as a pedestrianization program where you’re closing streets, but it’s really a broader, multifaceted effort Could you take us through each of the key elements and talk more about what you’re doing? DALLAS: We thought we need quick wins, so we used paint, provisional benches and planters on the pave way, and we changed quickly the look and the use of the streets. You have tarmac on the surface of the street, but putting a bench and putting a seat and a chair and a table you immediately think that this is a public space. This is a pedestrian area. So that’s what we did. At the beginning, in every step we knew how important it is to have the shop owners embracing our project. We started with giving them chairs and tables, and at the beginning nobody wanted to put them in the shop and store them at night. Once the first got that chair and table, everyone wanted one. Now, a year later they still bring them out on the street every morning and take them back at night when they close the shop. They even put plants on the—flowers on the tables. It really shows that they care about their environment now. ELDER: I know another key element was the visual cleanup of the neighborhood. For our listeners, this is a neighborhood where every available square foot of building or public space was a canvas for artists—graffiti, tagging, posters everywhere you looked. DALLAS: You explained exactly and described exactly how this area looked. In fact, from the questionnaires we did to visitors, we realized that especially for foreigners this kind of over-tagged area meant also an unsafe area. Up to now, we have cleaned and protected 73,000 square feet of facades, but we believe that in Trigono being an area very creative and an area where lots of artists are around, we believe that we’re not going to get a super clean pristine area but a kind of controlled area where you can have artistic interventions on façade but not tags. We showed that this approach of ours by starting a program for the electricity boxes are those—in Greece these are green. They were tagged, and they were full with posters and ugly. Through an open call we did—we got 30 artists for our 30 electricity boxes in Trigono who have painted them. Now, you can even tour 30 boxes in Trigono. ELDER: I know every time I walk through the neighborhood I will inevitably find a visitor stopping to take a picture probably for Instagram and post it of one of those electricity boxes. Can you say more? I know public art has been a big focus. What else have you done? DALLAS: We have abandoned buildings all over Athens and in Trigono as well. not owned by the municipality. They’re private buildings, so there is not much we can do regarding their reuse. We started this program of building wraps, and through the concept of contemporary Greek dancing we collected pictures from groups of dancers, Greek dancers. We printed big wraps, and we are covering these buildings up until they will be redone and reused. This changed the look of the area. It creates an atmosphere, and it helps for this upgrading of Trigono. Also, we found derelict abandoned buildings in the area, especially one of them. We cleaned it, and now we use it for exhibitions. This is a big success. We have more than a hundred artists have collaborated up to now in our events, and more than 14,000 people have visited the area for that. ELDER: Public space programs and business improvement districts are common in other parts of the world, but the institutional roadblocks you face here are unique. Can you speak a bit more about the challenges in Athens and what you’ve done to overcome them? Through two questionnaires that we have filled, one for the shop owners and another one for the visitors. We collected all the necessary data on which all our interventions are based. We found out that most of the people would come more often in the area if there were no cars. They would come more often in the area if there were more sitting areas. They would come more often if there was—if the place was cleaner, if there was more light. ELDER: One of the interesting data points that I remember from those surveys related to parking where we asked visitors how they had arrived in the neighborhood and found that over 95% had walked, and another three percent had arrived by bus or public transport, which meant that very few of those illegally parked cars in the neighborhood were from visitors. DALLAS: Yeah, so this helped us get to the conclusion that this will make their business better when they have more people walking and less cars parked in front of their shop windows. ELDER: What have been the impacts of the program so far? ELINA: Through the project and the changes that we made, we are attracting new businesses to formerly vacant buildings. Around 20 new businesses have opened in the area. We saw a supermarket in the area, one hostel, new hotels, and these are all creating new jobs for local Athenians. ELDER: I know that abandoned building that you’ve now turned into a kind of rotating exhibition space is just around the corner. Shall we go check it out? DALLAS: Okay, this is the exhibition. The title, the title is Genetic State, and it wants to show the transition in the city of the people of DNA of the people in the city. DALLAS: We found, yes. It was abandoned for the last 20 years. FREED: So abandoned for the last 20 years. DALLAS: We cleaned it. We, you know, and we started exhibiting here. FREED: Wow. So how many exhibitions have you done so far? DALLAS: Four exhibitions we’ve done here. FREED: And you seen this drawing people into the neighborhood and they’re actually coming to stop by and…? DALLAS: I mean it’s—what I was saying, here the shop owners are not so interested, but we have lots of young people, young artists. I mean we have—whenever we have the exhibitions here the place is full. They use the outer space. They drink out there, so, you know, when it’s a sunny day the place is perfect. ELDER: And the street becomes a public plaza because the cars have been removed. DALLAS: Yeah, exactly, yeah. The mayor, Mayor Kaminis, has been taking this very personally, so we are really very happy that he’s really backing our program. ELDER: I know he’s a regular presence in the street walking around observing the interventions, talking with shopkeepers and really being a champion for the program. How has Mayor Kaminis’ support enabled you to be successful? DALLAS: Mayor Kaminis himself envisaged the need of a similar project knowing the difficulties and being prepared to back us up all the way. We have been encouraged by our political leadership right from the start, and this has made a great difference for the program. ELDER: So with a multiyear program the work you do on day one is very different than the work you do on day 701. How has the program evolved over time? DALLAS: We started by focusing on firefighting. Painting the streets, as I said, in order to change the look of the area. Cleaning the tags. Getting infrastructure in place. Expanding to new streets. Now, we are shifting to more advocacy, being a voice for the community, focusing on capital works, and making sure that everything goes right and everything is in time. Thanks to Bloomberg’s focus on the data and metrics we are able to build the case for the program. ELDER: Thanks, Elina. We appreciate your time. ELDER: Elina has highlighted many of the short-term successes of the projects to date. Given those impacts, what does Trigono mean to the overall city and what can Athens learn as it embarks on future projects? KAMBOUROGLOU: It means that change for the better can happen and is already happening. Residents see a decrepit area turning into a beautiful public space that’s alive and inviting to new businesses, that’s clearly visible. So overall you see that change is possible. At the same time, the municipality through this process, is seeing that this can happen and can apply these lessons learned and the mistakes along the way to other parts of the city, as I’m sure they will be doing. ELDER: Alexandros, you’ve been spearheading many of the mayor’s efforts to engage the international community. Can you speak a bit about the impact of this work and why so many international organizations are attracted to working in Athens? KAMBOUROGLOU: To the latter part of the question as to why many organizations, international organizations are attracted to Athens, it’s difficult to speak for them. Athens is certainly on many levels a model or at the forefront of problems and issues that other cities in the west are going to face, be that the migration crisis that we’re facing and how that’s impacting the economy, the fact that it’s been facing a financial crisis that’s going to be close to ten years at this point, a growing city that concentrates about 50% of the population of the entire country. These are trends that will be happening in other countries as well. How Athens deals with a lot of these problems as a city is interesting to others. Now, as to why they’re engaging, the Kaminis administration has seen the importance of working with anyone who has knowledge and expertise to share in managing real everyday issues in the city. The administration is mature, and the municipality of Athens is open to listening and adapting knowledge that we may lack and to addressing problems here. This has been working really beautifully. You know that very well with the very close relationship with the Bloomberg Associates and Bloomberg Philanthropies as well. ELDER: Certainly, and I know that we’ve seen this firsthand at Bloomberg Associates and with the broader Bloomberg Philanthropies work going on in Athens. We’ve just been thrilled to be a part of all the different projects that we’ve been able to support with Mayor Kaminis and yourself and the rest of the Athenian leadership. OLIVER: We hope you enjoyed this episode of Follow the Data. We’d like to thank Alexandros Kambouroglou, and Elina Dallas for joining us today to talk about the progress in Athens’ Commercial Triangle. To learn more about the Commercial Triangle, please visit the “Athens Trigono” website at athenstrigono.org. To learn more about the Bloomberg Associates, visit bloombergassociates.org. This episode was produced by Ivy Li, Electra Colevas, Jake Elder and Emily Mayrath with music by Mark Piro — special thanks to David Sucherman. Thank you for listening – if you haven’t already, please subscribe. As our founder Mike Bloomberg says, if you can’t measure it, you can’t manage it. Until next time, keep following the data.